The United States’ military doctrine, as proclaimed by its Department of Defense, is to attain ‘full-spectrum dominance… in the air, land, maritime and space domains and information environment… without effective opposition or prohibitive interference.’ This is an agenda for global conquest – for an ever-expanding US empire. As America prepares for conflict with Russia and China, wars continue in the Middle East and North Africa, tens of millions are exiled from their homes whilst many more face famine. But there is not only hope for change in the air, there is active resistance. People all over the world are challenging the status quo by taking nonviolent action. 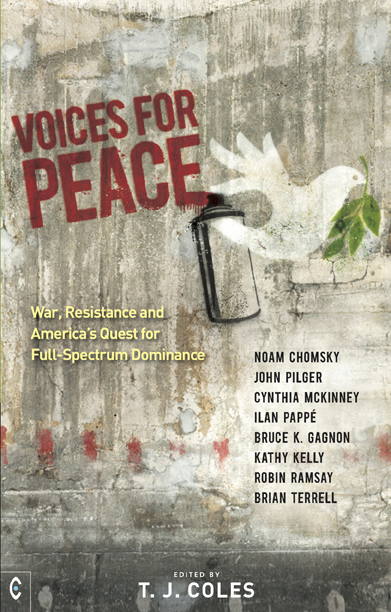 Voices for Peace features some of the world’s leading thinkers, journalists and activists, offering insight, inspiration and solutions to the world’s most critical problems: nuclear war, environmental destruction and refugee flows. In the wealth of material presented here, Kathy Kelly talks about the Afghan Peace Volunteers and Standing Rock protesters in the USA, calling for global unity. Bruce K. Gagnon’s piece on space weapons discusses South Korean activists’ opposition to American weapons in their country. Brian Terrell challenges the legality of drone warfare and outlines the grassroots links being forged between US and Russian citizens. Noam Chomsky discusses US policies towards Russia and Syria, as well as South America, trade, ISIS and Ukraine. John Pilger talks about the Trump-Obama naval build-up around China and exposes Britain’s ‘deep state’ connections to the Manchester terror attack. Former US Congresswoman Cynthia McKinney analyses the Charlie Hebdo attacks and the deep state in recent US history. Ilan Pappé offers an exclusive analysis of Israel’s actions to ethnically cleanse Israel of Palestinians. Finally, Robin Ramsay exposes the unconditional support given to the USA by successive UK governments. Seeking to inform and educate, this penetrating anthology is edited and introduced by author T. J. Coles, who gives a broader framework and context to the individual articles. T. J. COLES (Editor) received his PhD from Plymouth University (UK) in 2017 for work on the aesthetic experiences of blind and visually impaired people, which draws on the philosophy of cognitive psychology and neuroscience. He is also a columnist with Axis of Logic and the author of Britain’s Secret Wars, The Great Brexit Swindle, and President Trump, Inc.